So naturally we’re getting lots of questions from inspired and entrepreneurial customers about the new trend.What kind of vinyl works best? What kinds of cups and glasses are suitable? Are the applied graphics dishwasher-safe? Can I use my vinyl cutter, or do I need a heat press? Read on for the answers to all your drinkware decoration questions. The reference to plastic cups is added because not all plastic is vinyl-friendly. Low-energy plastics like polystyrene and polyethylene have static charges that repel the adhesives used in vinyl film, resulting in edge curling and eventual failure of the decal. Make sure you do adequate testing before committing to putting vinyl graphics on plastic cups. If you’re using mugs, glassware, or a vinyl-friendly plastic, your major concern is longevity of the graphic as the drinkware is cleaned. If your finished product is going to be tossed into a dishwasher, Dean recommends that the applied graphic be allowed to cure for at least 24 hours before washing so the adhesive has ample time to form a permanent bond with the drinking vessel. In our testing, EnduraGLOSS vinyl, ORACAL 651 and 751 all worked well on ceramic mugs. But there were differences in degree of success depending on the application technique. Given the cautions noted above, it’s wise to remember that this can be a challenging application. Designing a graphic with a fancy, filligreed font isn’t a good idea. Use relatively simple shapes; the bolder the font, the better the bond. The better the bond, the more washfast it will be. 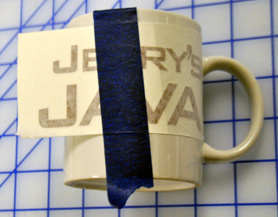 Fig 1: A vertical hinge is the fastest way to apply the vinyl and assure that it’s level on the mug or cup. • Apply Dry or Wet? When applying vinyl to any substrate, you want to make sure you put it on straight. When you’re decorating a banner that’s going to hang across the street, you may be able to get away with having if just a tad off level. But when the application is literally right in front of the customer’s nose, it’s gotta be straight. So applying it dry without any way to measure or adjust is a little risky. To make doggone sure the graphic is level with top & bottom of the mug, you can apply it with a little application fluid, or use the tried-and-true hinge method. In our testing, we used both wet and dry methods to apply vinyl to ceramic mugs. The ORACAL 751 graphic was applied with RapidTac. Since it has a permanent solvent adhesive, it should have handled the wet application well. But it’s hard to get all the fluid out from under the vinyl on such a severely curved surface, so it took quite a while for the adhesive to bond. In fact, the tape had to be left on overnight. When I finished removing it 14 hours later, one of the letters was still not completely set. This elongated cure time for the adhesive would also make the applied graphic more likely to fail in a dishwasher. So wet application is not the best method for these items. The EnduraGLOSS and ORACAL 651 graphics were applied dry with a vertical hinge (Fig 1), using Main Tape blue painter’s tape. This enabled me to remove the application tape almost immediately and it gave the applied vinyl plenty of time to set up before wash testing. • Dishwasher settings. If possible, advise your customer to avoid high temperature wash, and high temperature rinse. The extra heat added to the high water pressure and detergents, may shorten the life of the application. Our testing was conducted with these two turned off and the heat drying turned on. The two graphics that were applied dry came out fine. The one that had been applied wet had a very small amount of edge lift on the smaller graphic elements, but the rest of the decal adhered well. Remember that vinyl manufacturers don’t warrant these products for repeated exposure to the heat and water pressure of a dishwasher. Eventually, the graphic may begin to come off, if it’s cleaned this way repeatedly. It would be wise to tell your customers to wash it by hand. Many travel mugs are not dishwasher safe, so this shouldn’t be a major impediment to sales or customer satisfaction. If you need something more durable, or you want to decorate mugs with finely detailed images, you may want to consider dye sublimation or laser transfers. 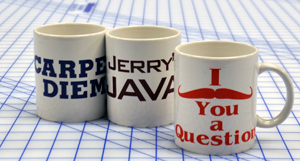 Sublimation is a durable tried-and-true method for decorating mugs. Since it’s a heat transfer method, it requires a mug press or mug wraps. You’ll also need a dedicated inkjet printer with sublimation ink, and the right transfer paper. A complete dye sublimation startup package, including a heat press, can be purchased for less than $800.00. Just as vinyl won’t adhere to all kinds of plastics, there are substrate limitations for dye sublimation. Any candidate for sublimation must be polymer-coated. You won’t find these mugs at the Pottery Barn, so your cost may be a little higher. Laser transfer is similar to sublimation, but with a slight difference. A heat press and specific types of transfer paper are still required, but standard mugs and glassware can be used; no polymer coating necessary. Either technique will give you more design options–including gradient color fills and photographic images– and eliminate the need to weed. But if you’ve got a cutter and want to jump on the decorated drinkware bandwagon, have at it. Your EnduraGLOSS, ORACAL 651 or 751 should work well. Just keep the design simple and apply it dry. Be wary of cheap plastic cups, and make sure your customer knows the vinyl appliqué is not fully warranted for dishwasher use. If it’s hand washed, it should last a long time. Then again, if it comes off in the dishwasher, they’ll just have to buy another one. Maybe you could sell them in pairs: one for regular use and one for the knickknack shelf.